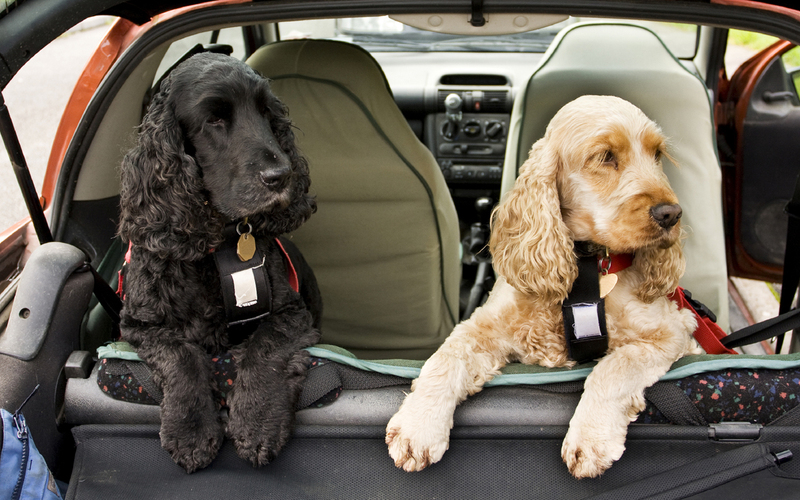 (P1) More people than ever are taking ROAD TRIPS and are bringing their dogs with them. While we are on the road, we want to keep our dogs safe, because they are members of the family. (P2) Dogs should never ride on your lap or next to you in the passenger seat. If you were to stop suddenly, your dog could go through your car’s front window. If there is an accident and your dog isn’t RESTRAINED, he could PANIC, get out of the car, and get lost. (P4) Dogs should be in the back of your vehicle in a roomy CRATE. The crate should be secured so that it does not slide around. (P5) If your dog is not used to riding in a car, take short rides with him first. He will learn to associate car rides with being with you, and it will make the rides a pleasurable experience for him. (P6) Talk to your dog while you drive! It will keep him calm and happy. (P7) When traveling with a dog, always add in extra time. If you think it will take you four hours to reach your destination, add an additional hour to the trip. Take breaks every few hours to allow your dog to ELIMINATE and to exercise. A short walk is very good. (P8) Make sure that your dog drinks plenty of water during these stops. (P9) What should you bring for your road trip? (P15) Make sure your car is well VENTILATED and cool, and never leave your dog alone in a parked car, not even for a couple of minutes. This is very important. On hot days, even in the shade, cars are like ovens; they heat up, and the results can be LIFE-THREATENING for your dog (for children and babies, too). Temperatures inside cars can reach 160 degrees Fahrenheit. (P16) You don’t want your dog locked inside your car on cold days either. Temperatures can PLUMMET and dogs can freeze. (P17) If you do take your dog on the road with you, you have numerous hotel options. Many places welcome WELL-BEHAVED dogs. There are websites about PET-FRIENDLY hotels that you can check IN ADVANCE. Have you ever traveled with a pet? Other pets like cats are much more difficult to travel with. Why is that true? If you like dogs, do you prefer bigger or smaller dogs? American really do consider their pets to be members of the family. Is that also true in your country?